People in the North East have voted "no" in a referendum on whether to set up an elected regional assembly. Deputy Prime Minister John Prescott admitted his plans for regional devolution had suffered an "emphatic defeat" on Thursday night. The total number of people voting against the plans was 696,519 (78%), while 197,310 (22%) voted in favour. Official figures showed 47.8% of the region's 1.9 million voters took part in the all-postal ballot. "The North East public have answered in an emphatic way. I am a democrat and I accept that. "I was surprised by the clear majority and I think there was a number of reasons for that - and claims of more politicians and greater council tax has an effect. "It was an overwhelming defeat for the proposal put before the North East public. As a government we believe in letting the people have their say," Mr Prescott said. 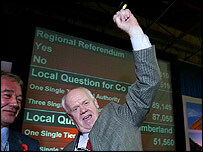 John Elliott, chairman of the North East Says No campaign, was pleased with the result. He said: "I'm not interested in giving the government a bloody nose - I am sure they are honourable people. 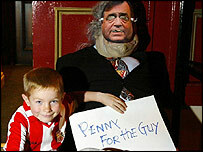 But I would rather John Prescott has two weeks' embarrassment than us be saddled with a £25m white elephant." Conservative spokesman for the regions Bernard Jenkin said the vote would mean the end of plans for a north-east assembly. He told the BBC: "The whole idea of regional government has been blown out of the water by this vote. The end for regional devolution? "People are fed up with being dictated to from Westminster but they don't want a toothless talking shop as offered by the Labour Party." Local government minister Nick Raynsford said the government had to go away and "reflect" on the North East result. But he refused to rule out holding two further referendums in Yorkshire and the Humber and the North West. "I don't want to make an instant decision on anything. There are important lessons to be learned from yesterday's referendum and we need to consider them in the cool light of day," he told BBC Radio 4's Today programme. Liberal Democrat regions spokesman Ed Davey suggested the result might have been different if the government had promised the assembly more powers. There was still a need for power to be devolved from Whitehall, he said, and more thinking was needed about the best way to do it. Merseyside Labour MP George Howarth said the North East referendum showed voters had "no appetite" for assemblies based on areas they do not identify with. He said the result meant "fresh debate" could be held about local government for regions based on cities such as Liverpool or Manchester. But the Yes For North West campaign says the vote must take place. Ministers believe assemblies will give a voice to regions distant from Westminster and return power to local people from the non-elected bodies that oversee many services. But anti-regional assembly campaigners argued the new tier of government would be an expensive talking shop with very little real power. BBC political editor Andrew Marr said many in the No Camp were Eurosceptic campaigners and ministers would need to reflect on the lessons for its referendum on the new European constitution.